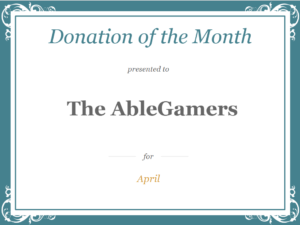 This month’s donation goes to AbleGamers. AlbeGamers modifies gaming setups for individuals with disabilities. We first encountered AbleGamers with my daughter at an Abilities Expo. Whether it’s special switches, keyboards, eye gaze, or mouth switch – they have it all. Their technology enthralled my daughter for a good 20 minutes (a record for her). When she’s a little older, we’re hoping to work with them to outfit a system for her. The technology alone is cool. But I want to talk about their presence on Twitch.tv. Twitch is a social video platform formed around the gaming community. But it’s become so much more. Sure, you can watch people play video games. But you can also watch people paint, make pottery, all sorts of things. AbleGamers is the only non-profit I’ve encountered using Twitch. And they do it perfectly. We get to see some of the technology at work. They can fundraising. But mostly, they are hanging out and engaging with their audience in a way that even the best social media managers on Facebook and Twitter can’t match. And it’s addicting. My gaming years peaked when I beat Mike Tyson in Punch Out. But it’s taken me well over an hour to write this, because I was sucked in. 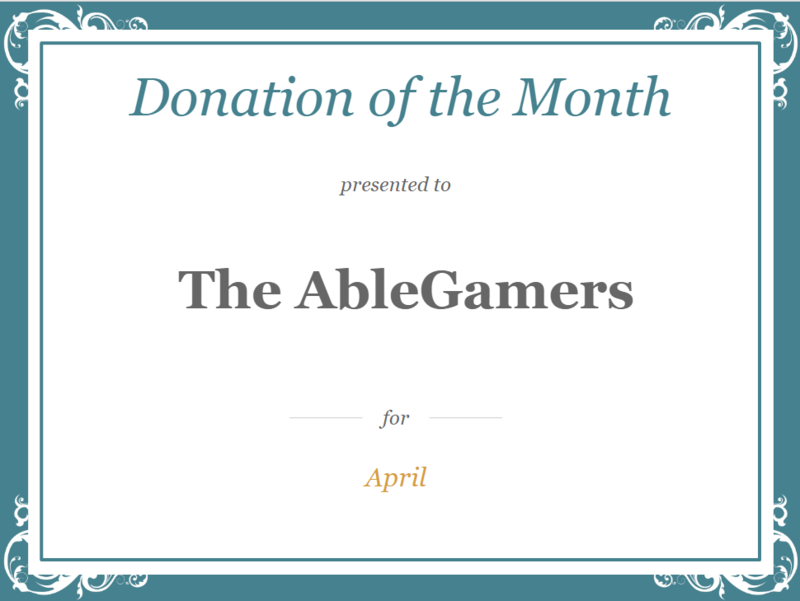 So, for using a social video platform for awareness and fundraising, AbleGamers gets April’s Donation of the Month. You can donate, and check them out Twitch. Just make sure you have a few hours to spare.